In order to make navigating and staying in Oakland easier, OTMA offers parking reservations to anyone in need. Dedicated reserved parking will be ready and open upon arrival. All you need to do to reserve your spot is complete our Parking Reservation form. OTMA staff will make and confirm each reservation at no cost, however, parking rates are determined by the Pittsburgh Parking Authority and will be the sole responsibility of the participant. Please note: The Parking Reservation program is in partnership with the Pittsburgh Parking Authority and reservations are only available Monday through Friday between the hours of 10am and 2pm at the Forbes Semple Garage. 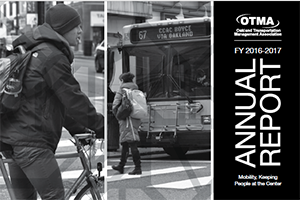 OTMA's Interactive Multimodal Resource Map is the ultimate guide for Oakland commuters. While it does have the locations of parking garages, lots – essentially every possible place to park in Oakland – and other helpful information for drivers, it is not limited to traveling by automobile. No matter what your mode of travel, it highlights important locations of all facets of Oakland transportation both large and small, including everything from bus stops to bike racks to parking garages, as well as points of interest for the campuses of Carlow, Pitt, UPMC, and CMU, the Interactive Multimodal Resource Map is the perfect Oakland travel aid.